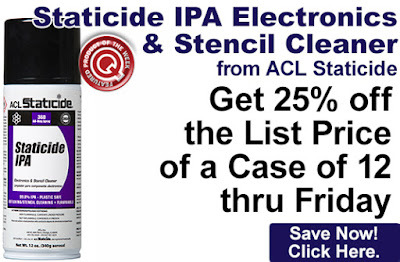 Get 25% off the List price of a case of 12 of ACL’s 8625 Staticide IPA Electronics & Stencil Cleaner (12-oz. cans). To take advantage of this discount, just add the Staticide IPA to your shopping cart. Our Featured Product promo is valid Monday, August 28, 2017, through Friday, September 1, 2017. The 8625 Staticide IPA is made with 99.8% pure anhydrous isopropyl alcohol and contains the least amount of water possible for quicker evaporation. 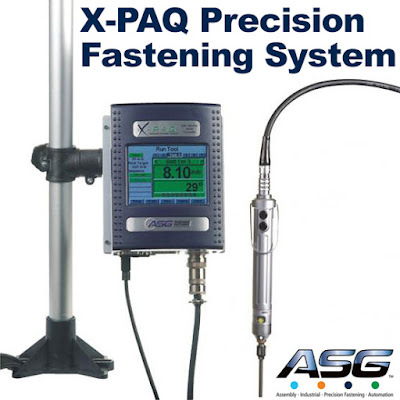 It removes flux residues, grease and other handling contaminants and safe to use on plastics. Please see the product page at QSource.com for more details. Click here to shop for the ACL Staticide IPA. For further questions, call us (800-966-6020), or send us an email. Please note: This promo is valid only at QSource.com. 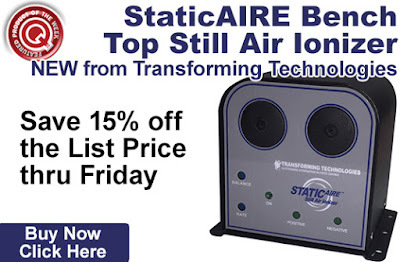 Save 15% off the List price of the new Transforming Technologies IN1000 StaticAIRE Bench Top Still Air Ionizer. To take advantage of this discount just add the StaticAIRE to your shopping cart. Our Featured Product promo is valid Monday, August 21, 2017, through Friday, August 25, 2017. The StaticAIRE was designed for use in a variety of localized applications where space is limited and helps you quickly and effectively eliminate static without using airflow. Please visit the IN1000’s product page for more details. Click here to shop for the Transforming Technologies StaticAIRE. For further questions, call us (800-966-6020), or send us an email. Please note: This promo is valid only at QSource.com. 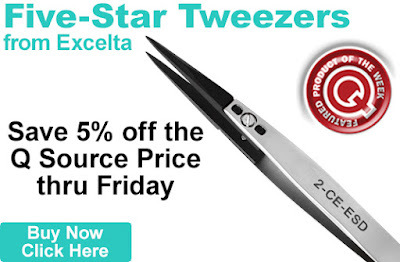 Save an extra 5% off the Q Source price of Excelta’s 5-Star Tweezers. To take advantage of this discount just add an eligible tweezer(s) to your shopping cart. Our Featured Product promo is valid Monday, August 14, 2017, through Friday, August 18, 2017. These tweezers are built from the most advanced materials available and designed to provide ultra-precision for use in the most critical applications. Please visit the individual product pages for more detailed information. Click here to shop for Excelta 5-Star Tweezers. For further questions, call us (800-966-6020), or send us an email. Please note: This promo is valid only at QSource.com. Leading off this week’s column: We check out this Zebra Technologies post that says half of manufacturers will adopt wearable technology by 2022. 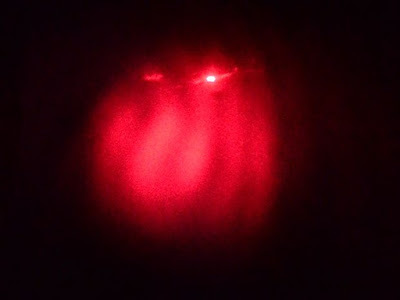 Do you know the differences of welding, brazing, and soldering? Weller’s post fills in the details and suggests which is best for what jobs. Who killed Oetzi the Iceman? Agilent Technologies’ post examines this extremely cold murder case. If you work outside during the hot summer months, remember the advice in this Wearwell post…WATER, REST, SHADE. 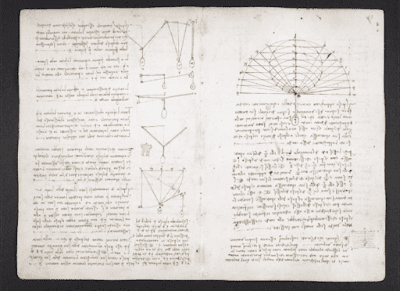 Laughing Squid’s post offers an online look at Leonardo da Vinci’s amazing Digitized ‘Codex Arundel’ Notebook. And we close out this week’s column with our post about our updated Current Promos page and some new ways to save. 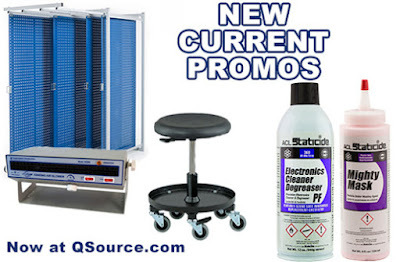 Save an extra 20% off Q Source’s price of Luxor Audio/Visual & TV Display Carts. Take advantage of this discount when you add an eligible product to your shopping cart. Our Featured Product promo is valid Monday, August 7, 2017 and runs through Friday, August 11, 2017. Our promo-eligible carts and stands are ideal for office applications, presentations and more. They were designed for use with audio/video equipment such as flat panel TVs and display monitors. Check out the individual products pages for more detailed information. 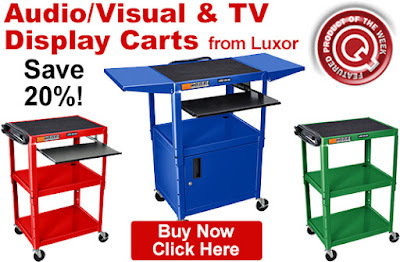 Click here to shop for Luxor Audio/Visual & TV Display Carts. For further questions, call us (800-966-6020), or send us an email. Please note: This promo is valid only at QSource.com and expires on Friday, August 11, 2017.